From the Hancock County Courthouse, travel on Hwy 22 West for 10.2 miles. Turn left on Tom Brown Rd. Travel 0.6 mile to field road and turn right. Travel about 100 yards from Tom Brown Road. 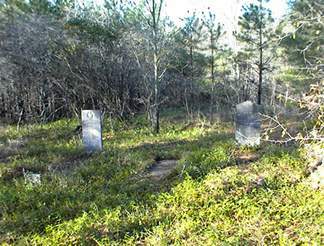 Cemetery is about 50 yards to the right of the field road under a large pine tree. Could be more graves in this cemetery than are listed -- it is difficult to tell. The field road is 0.2 mile from the intersection of Tom Brown Rd and Beulah Rd. s/o Elizabeth "Bettie" Bethea Boyer, per Raymond Boyer. "It was hard to give thee up, But Thy will o God be done." w/o S. S. Schell. "She was too good and too gentle to dwell in this cold world." Brick - probably originally a tomb above ground. 1st w/o Jasper Boyer. All info from "Elias Boyer of Hancock County" by Mrs. James J. Muldrow, and confirmed by Raymond Boyer. Buried somewhere in this cemetery.